A house with mold poses severe health risks for its inhabitants, reducing quality of life. It also harms the value of the house and may affect the structural integrity. There are thousands upon thousands of species of mold, many that have yet to be identified, that each have their ideal environment. Problematic mold in the house tends to prefer surfaces that have higher humidity, lack exposure to sunlight, and have poor ventilation. 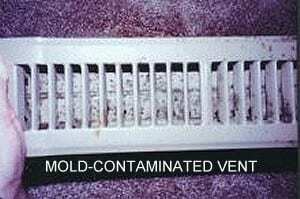 What you can take from that is a good prevention against house mold is to dehumidify and ventilate. 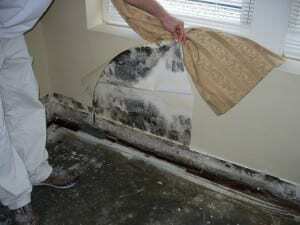 While non-porous walls reduce the likelihood of the mold embedding itself past the surface, any walls that are porous present a unique challenge. Often, they need to be cut away or removed to reach the whole mold infestation. A simple wipe down on the surface will not be enough, as the remainder of the mold colony has gone behind the wall. Drywall is largely made of cellulose and minerals that mold loves; wallpaper and wallpaper glue also produces a food source. The cavities behind walls are optimal for mold because they have limited airflow, limited sunlight exposure, and tend to be more damp than the outside air. Condensation forming on the window and along the window frame provides the moisture that mold needs to thrive. While mold cannot feed on the glass itself, a dirty window can provide food for the mold. The window frame and seal where the window meets the window frame is suspect, as well. Furniture made of organic materials such as wood or leather are prone to mold colonization. 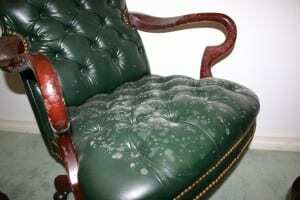 Upholstered furniture particularly absorbs moisture, making it an area prone to mold colonization. Check behind, underneath, and inside furniture. HVAC systems can cause cross contamination, as they allow mold spores to travel around the premises. 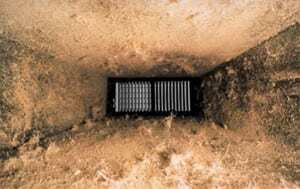 The heating or cooling system itself should be checked for mold, as well as any vents or ducts. 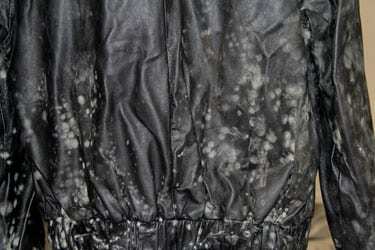 Clothing that does not necessarily see regular use may become home to mold, especially if left in mold’s ideal conditions of low airflow and darkness, such as a closet. Because clothing tends to be made of organic materials such as wool, cotton, or leather, they can become mold ridden and damaged. These molds should NOT be in a clean, healthy home! This mold has hundred of species spread throughout the globe. In a home environment, humid conditions allow them to grow on leather and cloth fabrics. Other species may also grow on grains and exposed food. They produce toxic metabolites and severe allergic reactions in individuals. 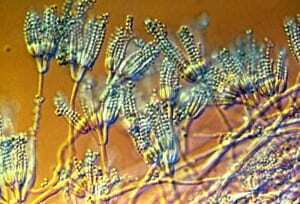 It is estimated people inhale thousands of Aspergillus spores daily, but our immune systems can fight them off — but the fungi itself can infect the lungs of someone with a suppressed immune system, a disease called Aspergillosis. There, it thrives off the warm, moist environment of the lung’s alveoli. 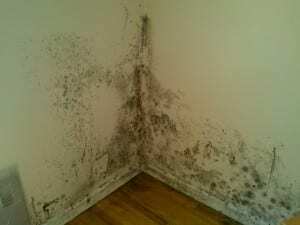 This “hairy” looking mold is considered a contaminant and a causative agent of infections. There have been cases involving immune suppression, brain abscesses, peritonitis, and onychomycosis. These produce olive-green to brown or black colonies. This mold has spores with a wide dispersion rate. Like most molds, it prefers a surface where moisture is present. Although not typically pathogenic to humans, it can cause skin and toenail infections and is a sinus and lung irritant. The spores are a known allergen. It looks like a newly budding tree underneath a microscope. Causes allergic reactions in both skin and bronchial tests. It may cause an infection called “mucrosis” in immune compromised individuals such as the young, the elderly, or unwell. It produces a strong musty order, as well as causing food spoiling and the destruction of leather goods. 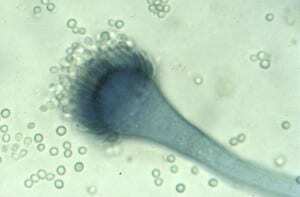 This fungus produces the neurotoxin verrucosidin as well as acids cyclopiazonic and penicillic. The liver, the kidney, and the neurological systems can all be adversely affected by this poison. Fever, anemia, weight changes, and skin lesions are common symptoms of having been exposed. Certain species produce penicillin, used to create antibiotics. The infamous “black mold”, Stachybotrys produces some of the most dangerous toxins of molds commonly found in the household. 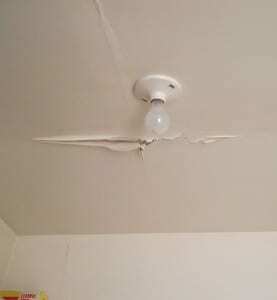 It feeds off the cellulose-rich building material such as gypsum and wallpaper, especially where there has been water damage or high moisture readings. It is possibly linked to the sick building syndrome. 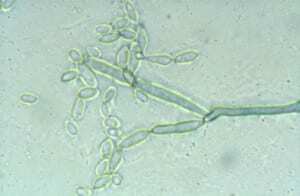 Stachybotrys poisoning causes pulmonary hemorrhaging, sinus irritation, headaches, and irritability. It suppresses the immune system, allowing other opportunistic infections to take hold. Most molds come in a variety of colors — from black, beige, white, green, brown, and so on. While not all visually black mold is Stachybotrys chartarum, the risk is definitely there. 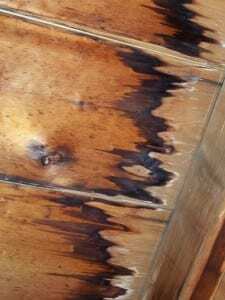 What happens if you are living in a home with black mold? Black mold isn’t just unsightly or foul smelling. Black mold damages the surfaces upon which it feeds and grows, reducing the structural integrity of a home. But black mold doesn’t stop causing problems there. If black mold gets into your own body’s system, it can cause extremely adverse health effects. By allowing black mold to stay and grow, you’re putting yourself, your children, and even your pets in danger. A house with mold is a dangerous and ill-suited for proper living conditions. The chemicals black mold releases as a byproduct of its respiration and digestion are known toxins, sometimes referred to as mycotoxins. When black mold is colonizing your home, it naturally releases spores as part of its reproduction cycle. 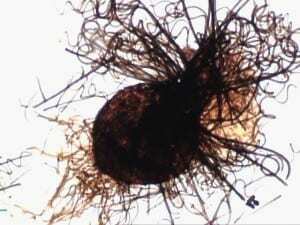 Microscopic, they drift through the air much like the cold virus; an unseen threat. These spores can be easily breathed in where they wreck havoc on your respiratory system as a foreign object; but as your lungs supply oxygen into your blood, the toxins from the black mold go with to the rest of your body. When your body is exposed to the toxin, it begins creating illness. 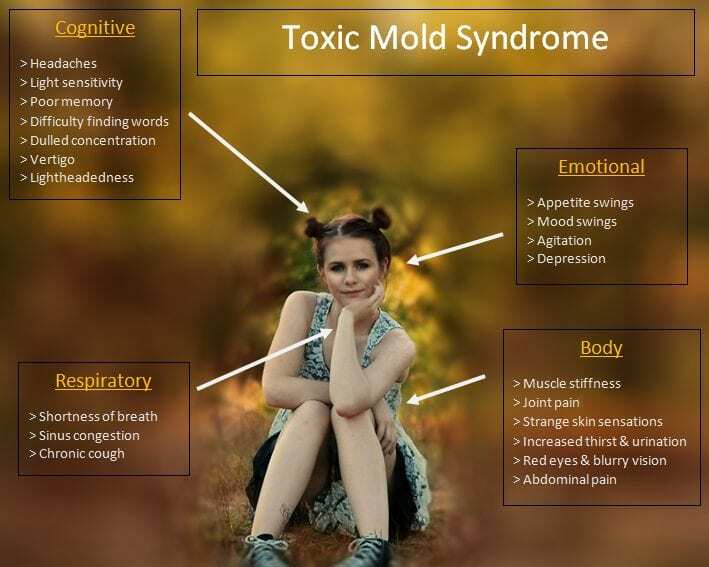 Headaches, difficulty concentrating, poor memory, shortness of breath, sinus inflammation, muscle stiffness, joint pains, feelings on the skin like crawling bugs, abdominal pain, are some of the many symptoms of having contracted the Toxic Mold Syndrome. Remember, this may not just happen to you; children, the elderly, and those with compromised immune systems are especially susceptible to becoming sick. This isn’t a mysterious disease; many clients come to Dry Ease Mold Removal saying their doctors have confirmed that their poisoning is due to mold. The obvious solution is to decontaminate the home. But a simple surface wipe isn’t necessarily going to clean your home of black mold. Mold has the ability to stretch “roots” far into material, meaning one mold spot could simply be an indicator of a larger colony hidden away. Mold also loves the minerals and dark, damp, quiet space behind walls that sheetrock and gypsum board provide. You may feel your home is dry, but mold can thrive off moisture we cannot superficially detect. It is imperative that you remediate with a professional mold cleanup company such as Dry Ease Mold Removal. We have the experience and extensive knowledge to clean mold from your home and prevent future infestations.